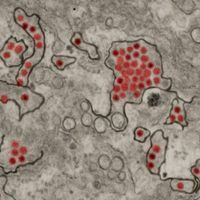 Transmission electron microscope image of negative-stained, Fortaleza-strain Zika virus (red)FLICKR, NIAIDDengue researchers around the world have been cracking open their freezers in search of serum or antibodies that might neutralize the related flavivirus, Zika. Three groups described such antibodies in the past week. In a paper published yesterday (June 27) in the PNAS, researchers from the Emory University School of Medicine in Atlanta and their colleagues described serum and monoclonal antibodies from nine patients in Thailand, where dengue is endemic. Most of the patients’ sera and some of their monoclonal antibodies were able to neutralize Zika virus in vitro, the researchers reported. 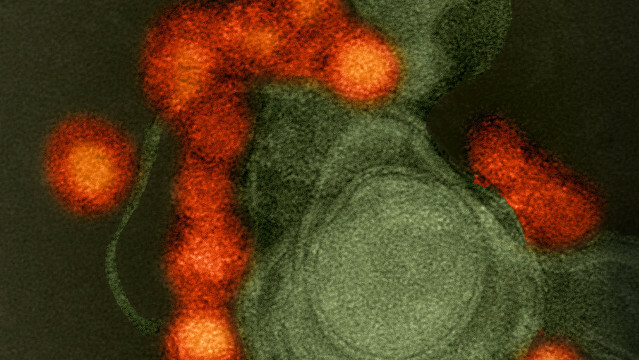 But the same sera and antibodies also enhanced Zika’s ability to infect human cells in vitro. “It’s well known in the flavivirus field that antibodies that don’t neutralize cause enhancement,” said Michael Diamond, who studies mosquito-borne pathogens at the Washington University in St. Louis and was not involved in the work. Antibody-dependent enhancement (ADE) occurs through Fc receptors, which bind the back ends of antibodies. Fc receptors are found on several cell types, including macrophages and placental epithelial cells. They internalize antibodies and may also internalize partially neutralized viral particles bound by those antibodies. This often happens in cases of secondary dengue infection, since each of the four dengue serotypes differ enough from one another that antibodies to one serotype can be poor neutralizers of another. Even sub-neutralizing concentrations of otherwise neutralizing antibodies can lead to ADE. Because placental Fc receptors transfer maternal antibodies to the developing fetus, some have speculated that maternal antibodies to dengue may not only worsen Zika, but also promote its transmission across the placenta. “It could be a double whammy,” Diamond told The Scientist. However, no one has observed enhancement of Zika infection due to dengue antibodies in humans or in animal models. Diamond noted that just because ADE occurs in vitro does not mean it will occur in vivo. 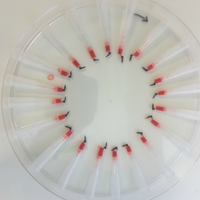 In fact, many in vitro studies have reported that anti-dengue antibodies enhance infection by West Nile Virus, yet that enhancement appears absent in vivo. 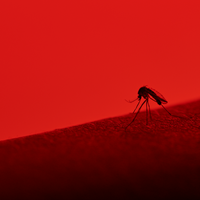 Emory immunologist Jens Wrammert, a coauthor on the PNAS paper, said large cohort studies are needed to discern what effect ADE between dengue and Zika may have on infection in humans. Because current diagnostic techniques rely on binding or neutralization assays, it’s impossible to tell whether someone with Zika also has dengue antibodies. Wrammert and colleagues plan to compare B cell responses of people with Zika in places where dengue is either endemic or absent, he said. In the meantime, the team will follow up on some of the dengue antibodies that did neutralize Zika in vitro, to determine where they bind the viruses. Wrammert and colleagues’ study follows on two others published last week (June 23) in Nature and Nature Immunology, in which scientists also tested sera and antibodies from dengue patients against Zika; most of these enhanced infection in vitro, the teams reported. Gavin Screaton, an immunologist at Imperial College London and coauthor on both studies, said in-vitro ADE was expected and may not reflect what happens in vivo. Still, the results of these investigations could help researchers home in on vaccine targets that are least likely to promote ADE in vivo. 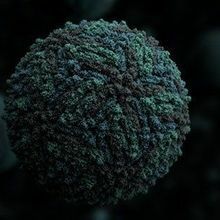 For the Nature study, Screaton’s colleagues used crystal structures to map out precisely how a particular class of Zika-neutralizing antibody binds a key region of the E protein found of both viruses, called the E dimer epitope. Screaton told The Scientist that he suspects the most potent neutralizer in Wrammert and colleagues’ study may also bind E dimer epitope. “So far, most of the cross-reactive antibodies against Zika have been poorly neutralizing,” Diamond said. The class of antibodies that bind the E dimer epitope, EDE1 antibodies, could be the exception, he noted. EDE1 antibodies are such strong neutralizers because they prevent flaviviruses from fusing with endosomes and releasing their contents into cellular cytosol. This also allows them to prevent ADE in vitro, Diamond noted, as Screaton’s team demonstrated in the Nature Immunology paper. The Nature study coauthors pointed out that these properties make the EDE1 binding site a good candidate for a vaccine that could protect against both dengue and Zika without promoting ADE. Meanwhile, additional vaccine candidates are likely to arise from studies of monoclonal antibodies derived from Zika patients. Many groups, including Wrammert’s and Screaton’s, intend to begin working with those samples soon. G. Barba-Spaeth et al., “Structural basis of potent Zika-dengue virus antibody cross-neutralization,” Nature, doi:10.1038/nature18938, 2016. W. Dejnirattisai et al., “Dengue virus sero-cross-reactivity drives antibody-dependent enhancement of infection with zika virus,” Nature Immunology, doi:10.1038/ni.3515, 2016. L. Priyamvada et al., “Human antibody responses after dengue virus infection are highly cross-reactive to Zika virus,” PNAS, doi:10.1073/pnas.1607931113, 2016.